ASN Complete is primarily used for printing GS1-128 shipping labels and linking them to the contents of your purchase orders. Shipping the orders completes the process and generates data for the 856 or DESADV transaction. But what does it offer you or your customers in the way of shipping reports? There are three basic shipping reports. Consider the Bill of Lading to be the top level report. This report is a legal document that establishes the terms and conditions between you (the shipper) and your receiver for the transfer of goods from one location to another. This document includes the BOL#, supplier and receiver addresses, a listing of all purchase order numbers and the number of cartons and pallets for each order. This report in ASN Complete conforms to the Voluntary Interindustry Commerce Solutions (VICS) standards. The second report is the Shipping Manifest. Use this report when you’re store shipments are going to an intermediate location (i.e., distribution center, consolidator) with the individual cartons marked for specific store locations. The manifest typically includes store location numbers, store addresses, purchase order numbers, number of cartons per order and weight/cube totals. This report can be customized as needed. The third report is the Packing List. Use a Packing List when your customer requires a listing of line items for the purchase orders on the shipment. This document includes the ship from and ship to addresses, purchase order number, item numbers and descriptions, quantity ordered/shipped, weights and the number of cartons. It could be a single report for all orders on the shipment or could be one report per order. This report can be customized as needed. 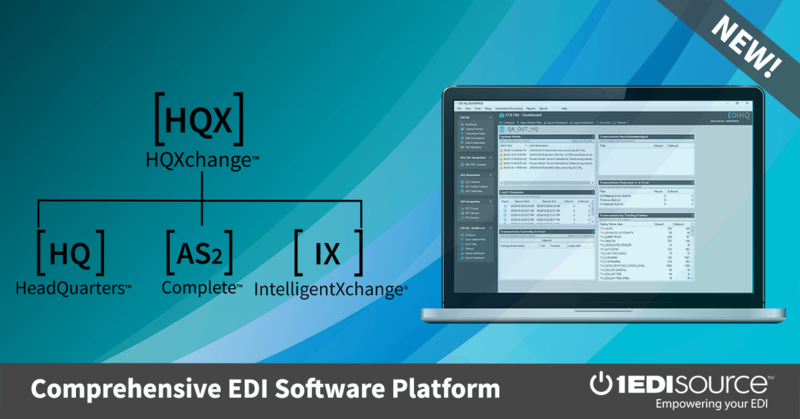 Learn more about transaction sets and contact 1 EDI Source today to implement EDI and get compliant with your trading partners.